Good morning and happy Monday!!! 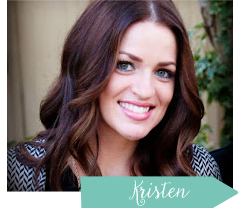 I wanted to welcome you all who are joining me from the talented Kellie's blog, Gratefully Vintage! Thank you so much for joining in on our blog hop! There are so many amazing options available out there, you'll be so happy you did! This is an E-design I proposed to my client in California. They just moved into an older home that had been remodeled and they were stumped with their front room. They wanted a room to make a great first impression to their guests and also a room where they could be happy relaxing as a family. The thing my clients gushed over the most was this area rug. 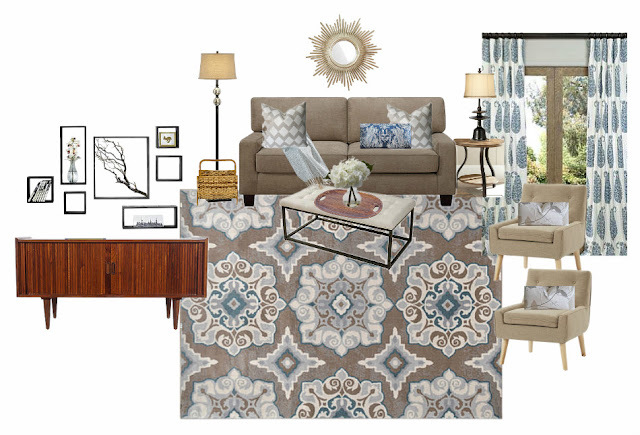 The rest of the design is great, but the area rug brings life into the room that couldn't have been accomplished otherwise. I was so happy to see this design come together. 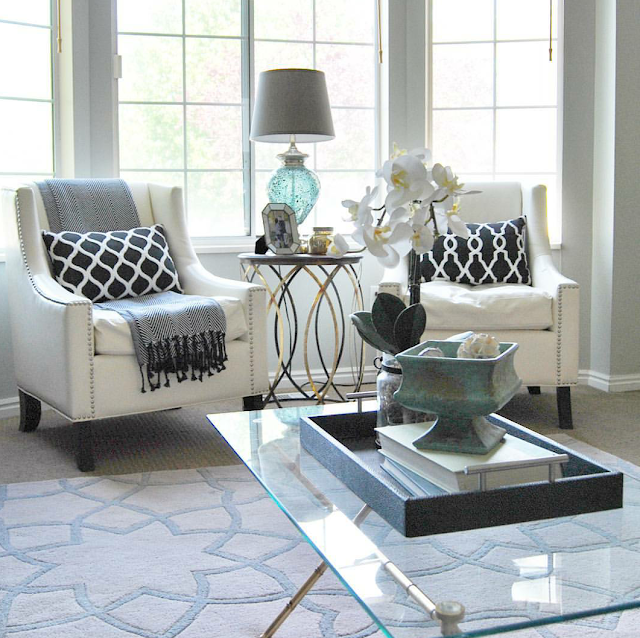 This rug makes the space, and my client has recived so many compliments on this rug first and foremost. White is a trend in the design world right now. But the best part about it is its such a timeless design move. 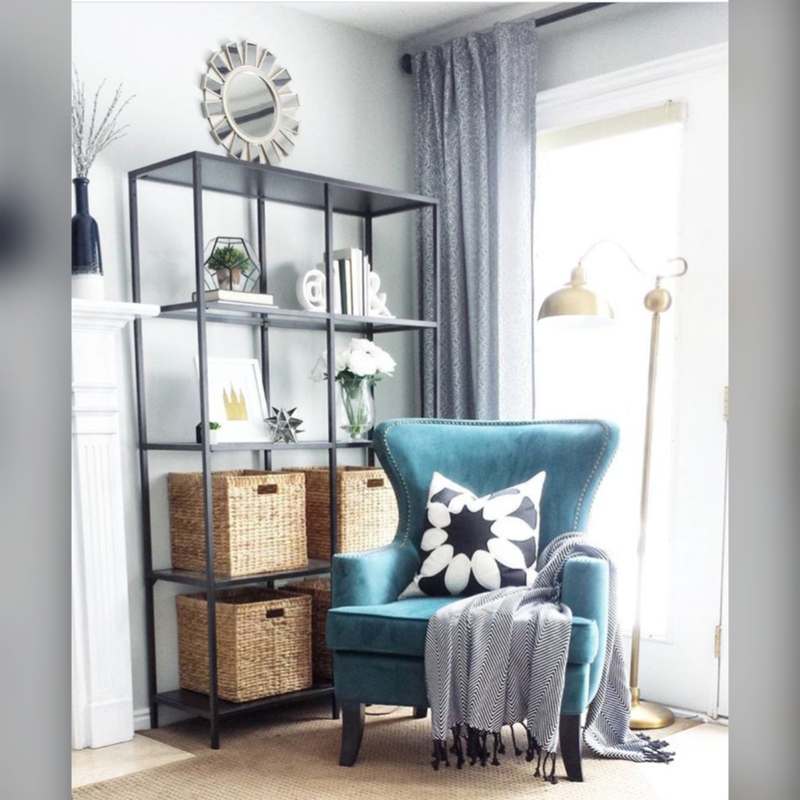 Your entire room doesn't have to be sterile looking, but if you add some pops of white like these shelves, or this white chair rail you will make your space so light and airy feeling. I remember when I proposed this dark charcoal color to my client. It looked SO dark on the swatch. She may have been a bit terrified. 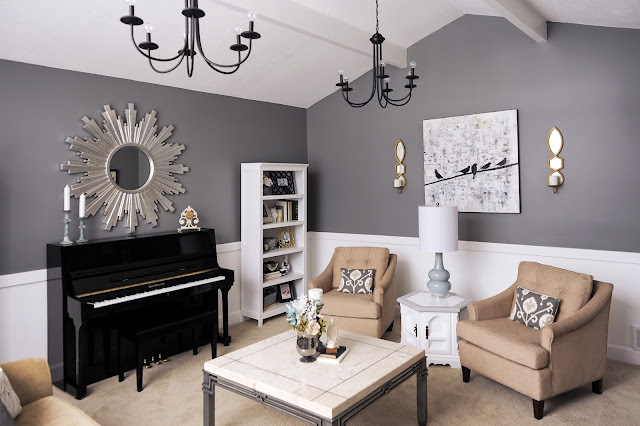 Thankfully she trusted me and balancing this dark color with the whites and lighter palette made the room have a bit of drama. She and I couldn't imagine this design any other way. Or take this picture below... There is a lot of pattern play going on. But it works because the patterns aren't competing with a loud base color. 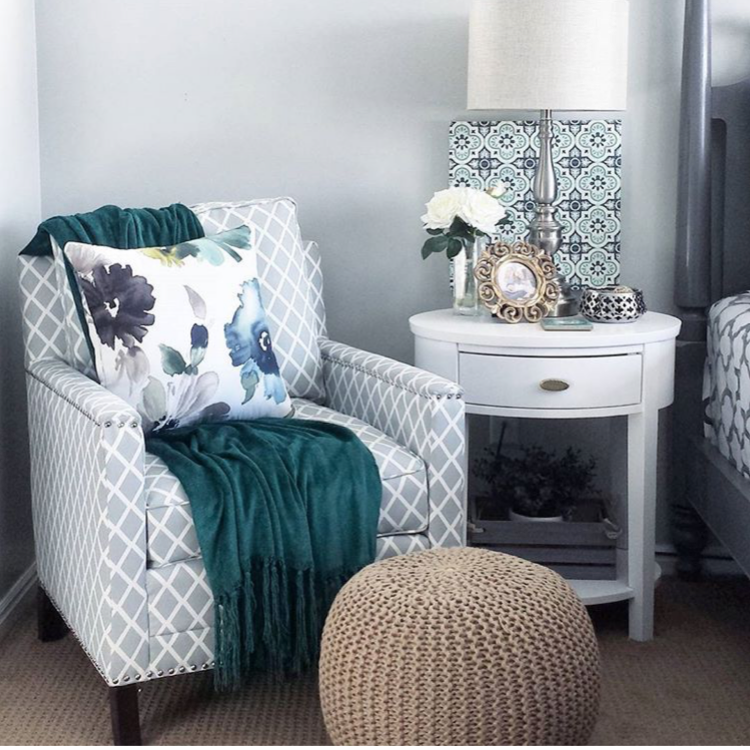 The white nightstand and the lighter palette creates the right base to make the boldness of the prints work together beautifully. I am in love with color. But, there is most definitly a right and a wrong way to do color. This blue chair is quite a bold choice... but notice the rest of the decor. It is all nuetral. By keeping the rest of the space in a nuetral setting it makes the chair not only stand out the way it should, but it makes the space a bit more soothing. I just created this E-design for a client in New York. 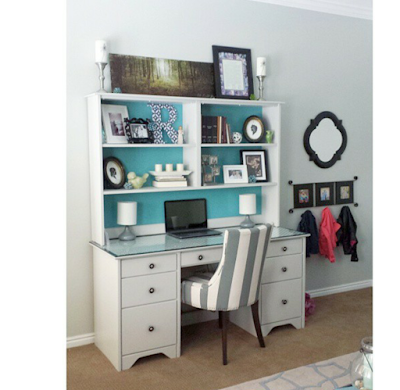 She requested a modern color palette but didn't want the room to seem too busy or too bold. The navy chair and the bright throw pillows and accessories add the right amount with out being too much. This room will still be soothing with out being too in your face. The perfect amount of color. 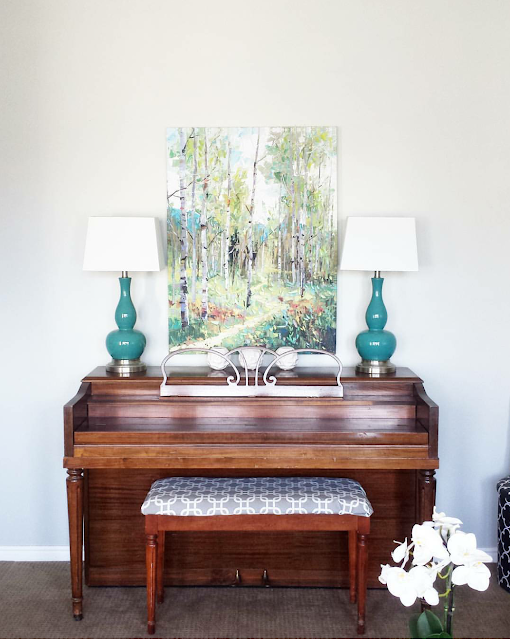 From throw pillows to curtain panels, to accent lamps to art work and accessories... All of these little things are what will make your spaces come to life. I have had so many people hire me after they have purchased their big ticket items and they get stuck on how to accessorize their rooms. Take the below pictures... This client did a fabulous job renovating and had their dining and living room sitting for over a year before they had me come and put the finishing touches on the space. Just adding this picutre gallery and some accessories on the table pulls the space together with out being stuffy or over styled. You don't need too much and my thoughts are always less is more when accessorizing. It truly is amazing how these few accessories brightened up this dining room and added some much needed life to this space. There you have it... some of my favorite ways to brighten up a space. I hope you find these tips and ideas useful when decorating your own homes! Be sure to stop by her blog to get her favorite tips and tricks on how to brighten up your home! Please visit my other friends' blogs for more lovely home pictures and great tips! I wanted to share the progress of my living room with you today and the plans for the other half of the room. I love how its come together so far, and my gallery wall full of my favorite quotes make me smile every time I walk in the room. 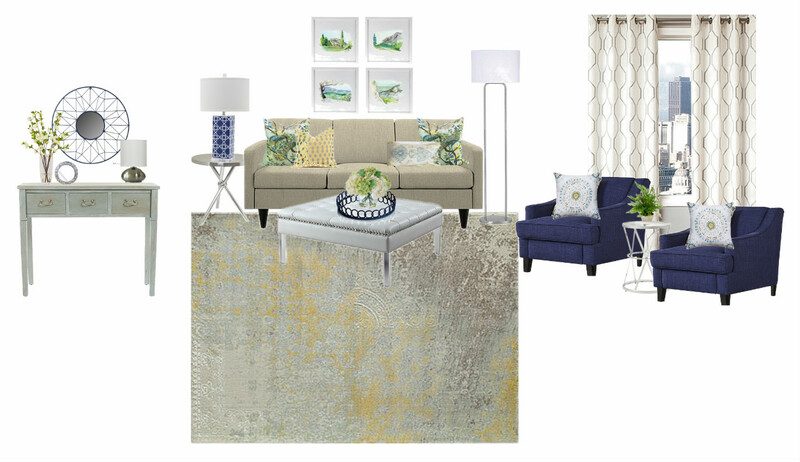 I love the cool, soothing palette, and the tiny pops of color adding some personality to the design. I have a piano on one wall, and have been going back and forth on whether to move my desk back into the room. We moved it out back in December to make room for our Christmas tree, and I just haven't been able to bring myself to move it back into the space. I'm not the tidiest person when it comes to my workspace... I always hated having it in my "first impression" room... So I think I've finally decided that I'm moving my desk into my basement family room so I can get work done there in a common space while my kids play. I actually moved the desk during nap time today and I'm writing this post with the desk in the common play area and its by far the most convenient work space I've had! 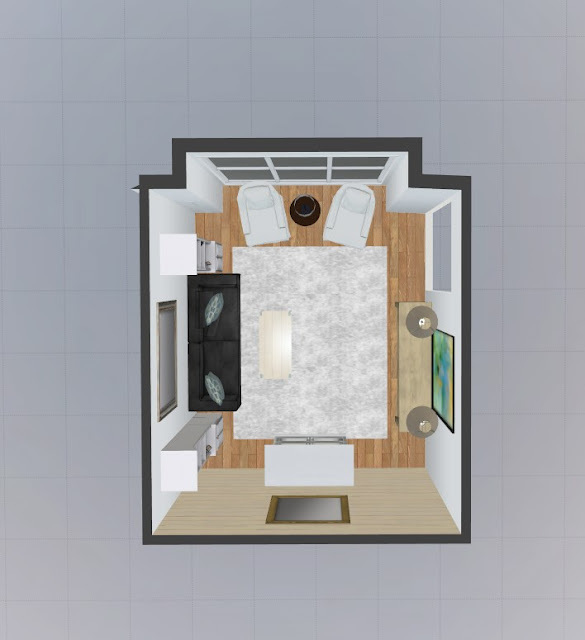 Here is the 3D design plans for the other two walls in the room. 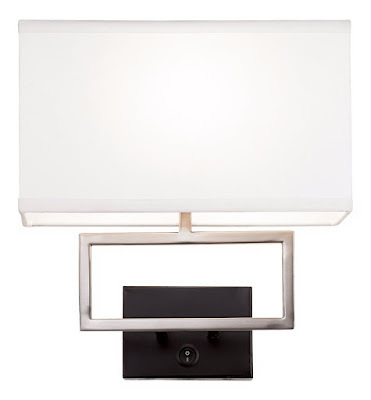 Again, www.ihomeregistry.com blew me away with their awesome website. If you haven't signed up with iHomeRegistry yet, you must!!! It's great for designers AND homeowners! 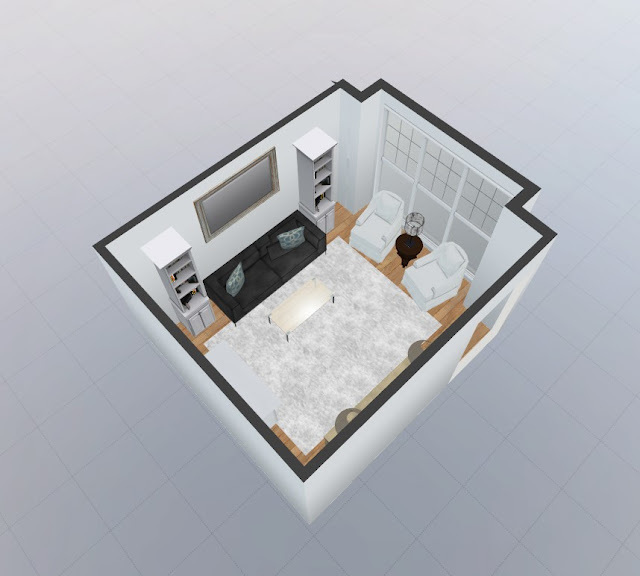 Homeowners can organize and store info on items they are thinking about buying for their home, connect with other homeowners and designers and use the 3D tool to make sure the furniture you are thinking of will fit the space well! This is my living room TO SCALE... With the exact measurements of items in the space and the items I hope to put in the room. 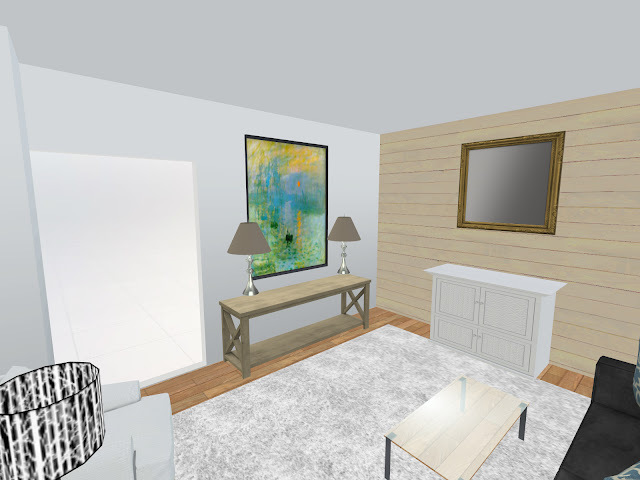 I've already used the program for a few new design proposals I've been working on and my clients LOVE to see their room like this. It makes going forward with the design process so much more comfortable for them, and puts them completely at ease. I love that this tool is also avaible to those who aren't designers. 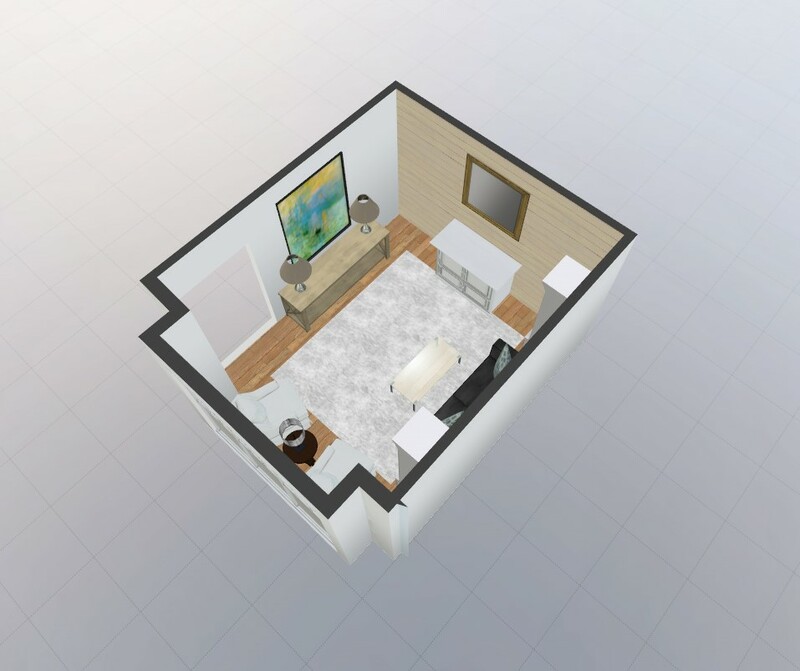 My dad is using it to save some money and do his laundry room plans himself... Its so easy to use, not to mention, pretty fun! Be sure to sign up while this amazing website is still free. I plan on using General Finshes Java Stain to repurpose my piano. There are so many knicks and dings on this from all the years of being used and I cannot wait to make this all new and beautiful with the stain! My dad bought this piano for my mom as an anniversary gift and he's asked me to keep the integrity of the wood... it means so much to them. Not to mention this is the piano that I learned on, and now my sweet almost 7 year old is learning on. I can't wait to show you the afters. 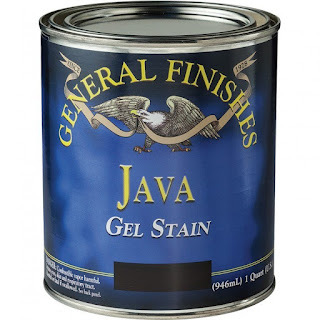 You can purchase General Finishes Java Gel Stain HERE. I then plan on creating a ship lap accent wall on the piano wall. There is no over head lighting so I will hardwire some sconces that will be turned on by a switch. This will add so much to the room. Those details with the focal point as my long time favorite antiqued brass round mirror and the accent wall will surely make me one giddy girl. I have my eye on this sconce. You can hardwire this one, or just hang and plug in if you aren't wanting to commit to holes in the walls. On the wall opposite the sofa I plan on purchasing a console table with ottomans underneath for extra seating options. 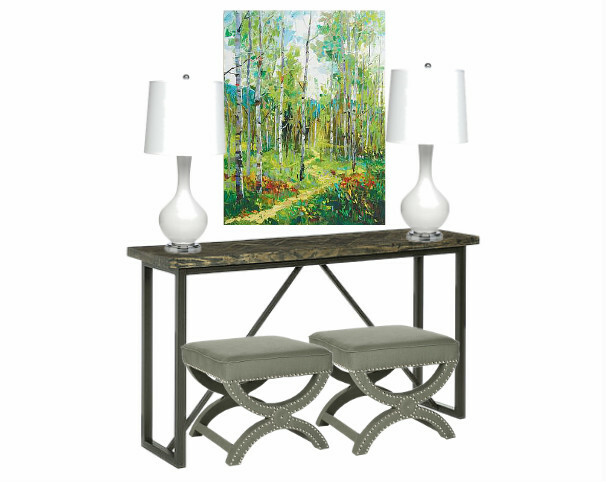 I will move the turquoise lamps to this table and will have this painting on this wall. Click on the links to Shop This Mood Board and the rest of the living room design! I cannot wait ot have the room complete! I'll be sure to share it as soon as its done... Be sure to check out @studio7interiors on instagram for daily pics and progress photos!